Rev. A. H. GRAHAM, B.A. THIS history of Second Boardmills would be incomplete without the recording of our thanks to Mr. Aiken McClelland. 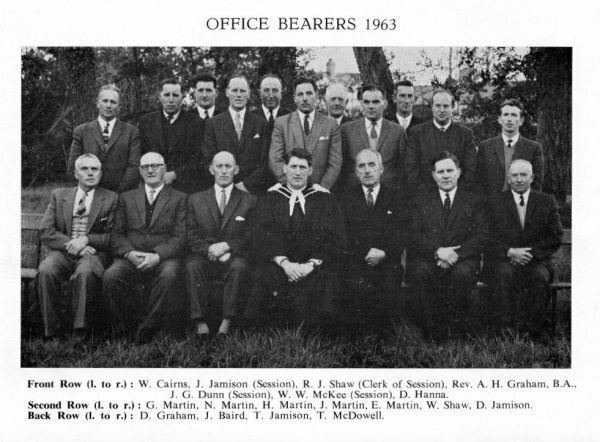 At one time a member of Committee in Second Boardmills Mr. McClelland still retains a keen interest in the church and district. We are greatly indebted to him for all his research, and painstaking work to ensure an accurate record of the history of Second Boardmills. The photographs were taken by Mr. S. Hopkins and we wish to express our thanks to him for all his help. 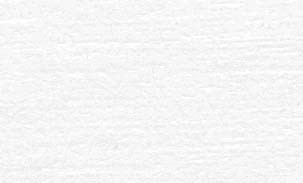 To mark our one hundred and fiftieth anniversary we are to be honoured by a visit from the Moderator of the General Assembly, the Right Rev. Dr. John Davey. Following his visit on Sunday morning the 3rd February, 1963, the Session plan to have special thanksgiving services in co-operation with Killaney and First Boardmills. The mission will be held each evening from 3rd February, 1963, to 17th February, 1963, and will be conducted by Rev. A. Malcolm Parke, M.A., Orangefield Presbyterian Church, Belfast. We hope that as you read this history and attend our special services you will be the better equipped to serve Christ in His Church during the coming years. ONE hundred and fifty years ago to-day the members of the infant congregation of "Scotch Seceders" petitioned their Synod for an election of elders-a request which resulted in the First Session being formed a few months later. To mark this sesquicentennial the Rev. A. H. Graham, B.A., invited me to write a brief history of the congregation, a task which has given me great pleasure. 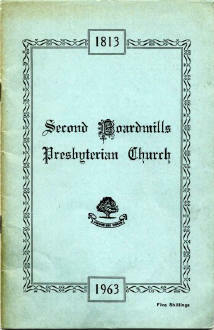 Second Boardmills enjoys an enviable and a justifiable reputation for kindliness, friendliness and generosity - ever the indications of a living and practical religion ; and as they read the story of their congregational life I trust their love and loyalty to the Church may be stimulated and strengthened.